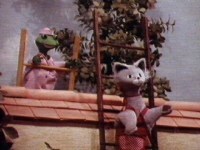 ZaZa and Kiki are up the ladders talking about Hector. Today, Hector received a big parcel of items. He wants to become a first class guard dog in 20 easy lessons. 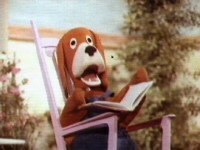 He begins reading from the books but realises he need to listen to the records for the correct growl and bark. 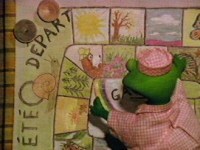 He brings out the gramophone player and begins to play the records. The lessons start with dealing with postmen. The second lesson is how to deal with the Butcher's boy. Hector repeats the growls and barks of each record. 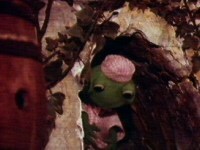 Lesson 3, how to behave with people who look over the garden wall. He listens to the bark on the record. ZaZa knows who he is referring to of course (Kiki). 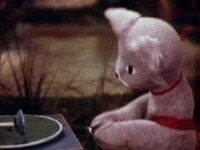 As usual the ending is Hector saying "lucky I'm a big old ambitious Hector"
ZaZa and Kiki are sewing. 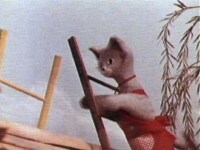 KiKi wants to be taught how to perform certain kinds of stitching. 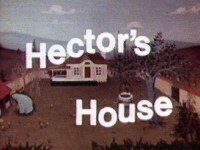 Hector ignores them and goes into the house. He keeps coming in and out but eventually says one of his immortal lines "Watcha girlies. 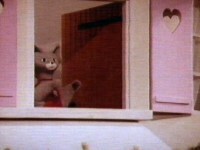 "ZaZa is appalled at his manners and accuses him of very bad behaviour. She gets him to greet Kiki in the correct manner. He does as he is told of course, anything to please ZaZa. 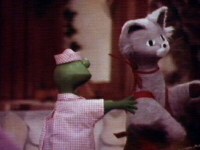 Kiki does not want Hector to be scolded as she thinks he is very kind. 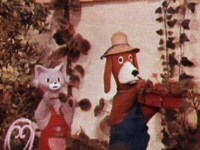 As usual the ending is Hector saying "I'm a big well mannered old Hector"
Hector is in the garden reading a book. 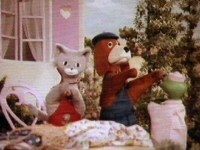 ZaZa is busy in the garden singing to herself. 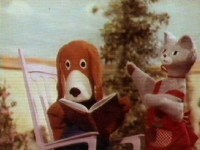 She wants him to cut up some wood but he is far to engrossed in the book. He finds it hilarious reading. 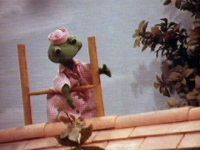 She reminds him of the chores that need doing such as the broken window, the broken wheelbarrow, the weeding of the lettuces etc. He explains that he has a headache and a sore tummy as well. 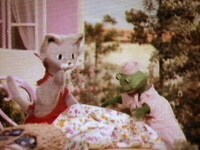 Kiki arrives and ZaZa explains that Hector is feeling unwell. 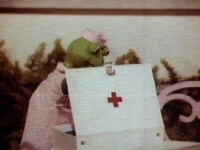 Kiki goes and gets her first aid kit full of medicine. Suddenly Hector feels very much better especially when he sees the hypodermic syringe that Kiki takes out of her bag. Kiki takes his temperature and says that he is very ill and that he should have lots of rest and keep a blanket on him at all times. 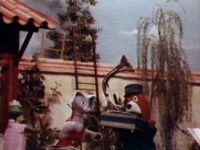 Hector upsets Kiki as he accuses her of being too nosey. Hector tells ZaZa what he has done. 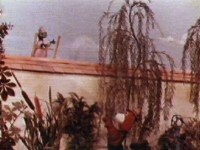 Kiki is crying on the other side of the wall and ZaZa says they must go and comfort her. 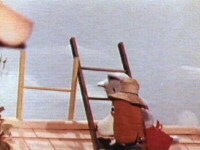 They climb the ladder and Hector apologises and agrees that he is an ill mannered bear, a bad dog, a big booby. He is ashamed of his behaviour. 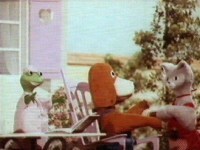 She comes round when Hector starts to sing a song for her. 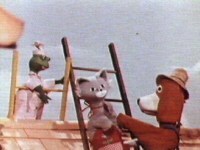 ZaZa joins in the song and all three of them make friends whilst on the ladders. 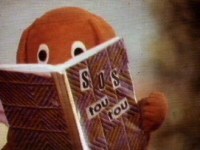 Hector agrees she is not nosey but she is kind, clever and has a pretty hat. 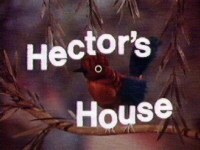 As usual the ending is Hector saying " I'm a just big old Hector the diplomat"